← Dementia? Perhaps death is the preferable alternative. 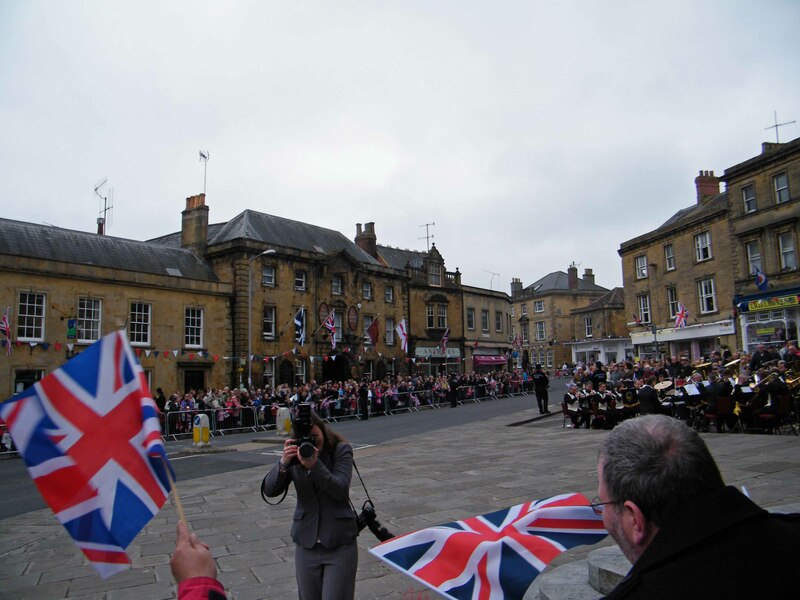 When it was announced the Queen was going to visit nearby Crewkerne as part of her Diamond Jubilee Tour of the country, I can’t say I paid too much attention to it until my 8 year old son said he wanted to go to catch a glimpse of HM. I’m not entirely sure it was more a case of being able to miss school for a morning that was more appealing, but I was glad he was showing an interest in part of our great heritage, so agreed to take him along. We arrived at 8.30am and there were already large crowds gathering behind the barriers. After some discussion, we decided the best spot was next to the Town Hall where she was due to visit. Sadly there was no room at the front for my 8 year old sized son but the good-natured person at the front said he could stand in front of him. Thus begun the loooong wait. Rather surprisingly the first hour and a half passed by quite quickly and the crowds had grown even more. The atmosphere was happy and jovial and the very heavy police presence didn’t detract from everyone’s pleasure. My son, incredibly, managed to keep himself entertained with a pad and pen (an obvious genius in the making) and didn’t moan once. 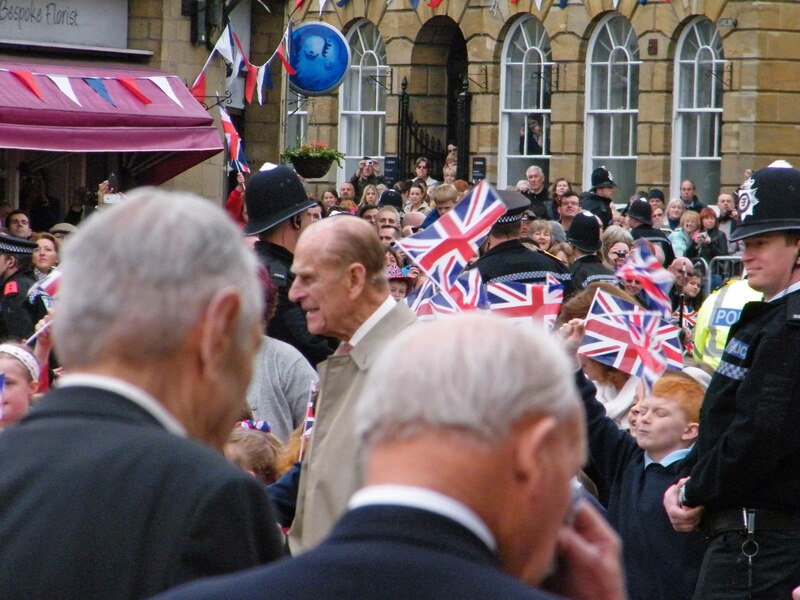 But soon the hour of the Royal arrival neared as did the crowd behind us and things were becoming a bit cramped. That’s when the “can we go now” began. I can’t blame him, we had been standing for nearly two hours and it was evident that HM was running late. We were kept entertained by the band who played a mixture of tunes including The Village People’s ‘YMCA’ and the theme tune to the film ‘The Flintstones’ to name but two. However when they struck up ‘God Save Our Gracious Queen’ we all had a pretty good idea she was on her way. Sadly by then our rather perfect line of vision had been somewhat ruined by a line-up of dignitaries and our perfect spot became rather less perfect. My poor son was being quite badly jostled by now and even with me lifting him up, the novelty of seeing HM was wearing off rapidly. 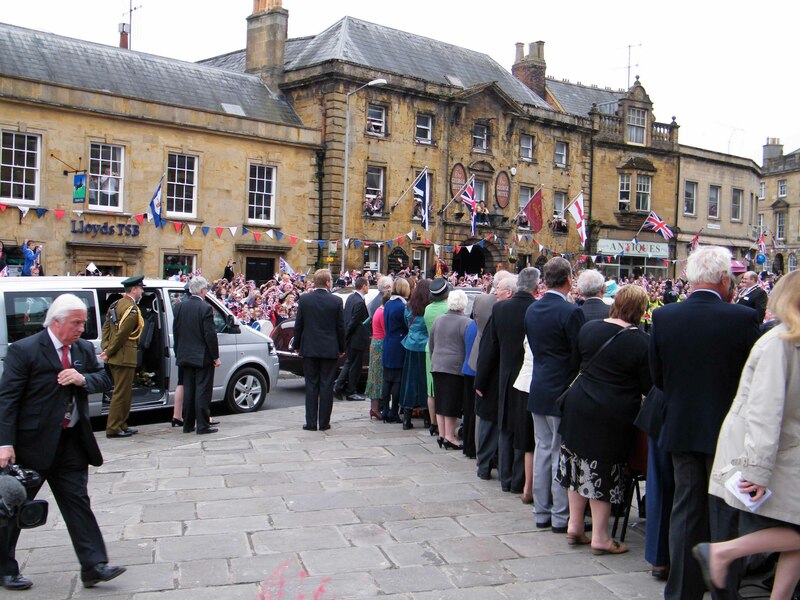 However the cheers went up and the crowd went wild as HM arrived then left her car and walked up and into the Town Hall. She was in there for several minutes and when she re-emerged there was another welcoming shout and dare I say, an expectation that she might do a bit of ‘meet and greet’ with her gathered subjects. 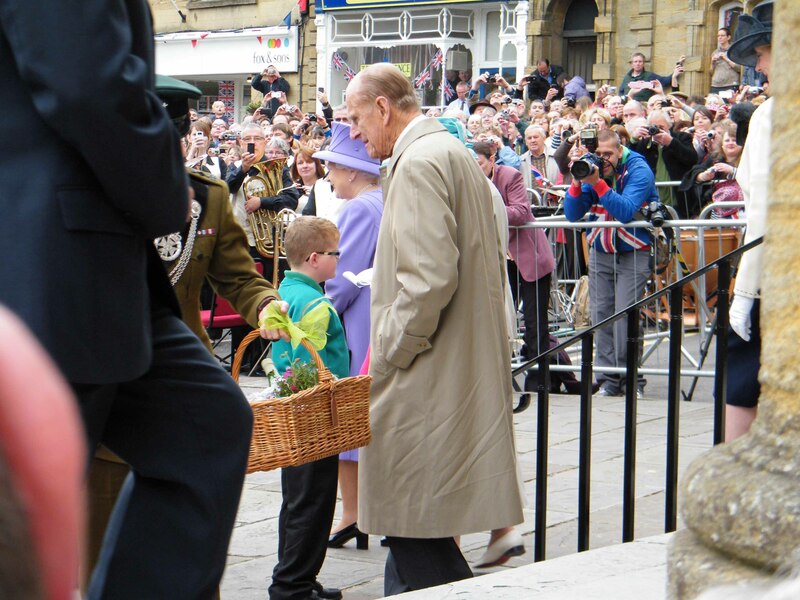 The two young children who had been chosen to present a basket of goodies to the Royal couple couldn’t have been better behaved and HM along with Prince Phillip seemed to have a bit of a rummage to see what was in there. However, it seemed that no sooner had they received their basket of goodies, it was time to leave. There was no Royal wave to the crowd, no shaking of a few hands, not even a quick stroll around the ringside. I managed to catch a quick glimpse and my son saw the top of her rather fetching purple hat, but after the build up and the anticipation, what can I say? It was all a bit of a damp squib. After just a few seconds she was ushered to her car and whisked away to the waiting helicopter in nearby Maiden Beech School. Having been up close on previous occasions, I don’t feel I missed out on seeing HM, but for the hundreds of children who will probably never get another chance, it seems a pity that the memory of today for them will be a very large crowd, some very large vehicles that parked across the front of them and a great deal of flag waving. 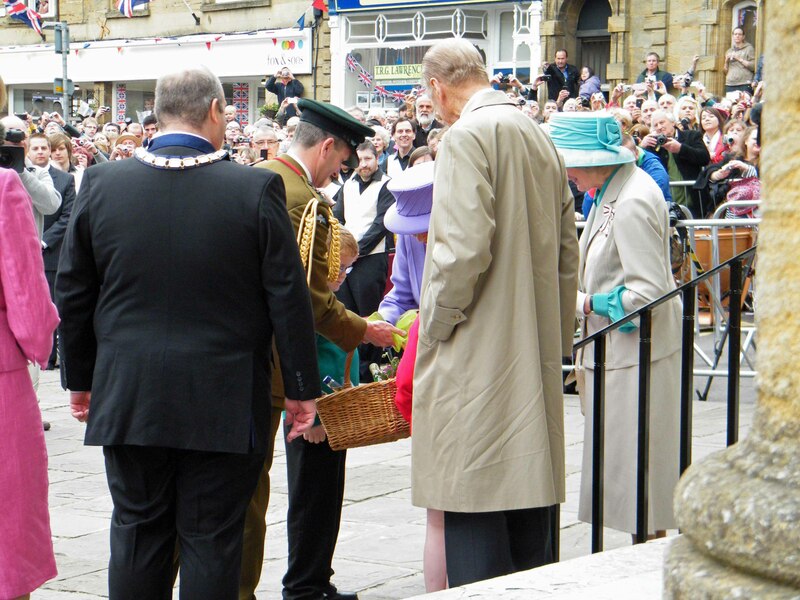 The Queen did indeed visit Crewkerne today, but it would have nice had it been less of a flying visit ma’am. 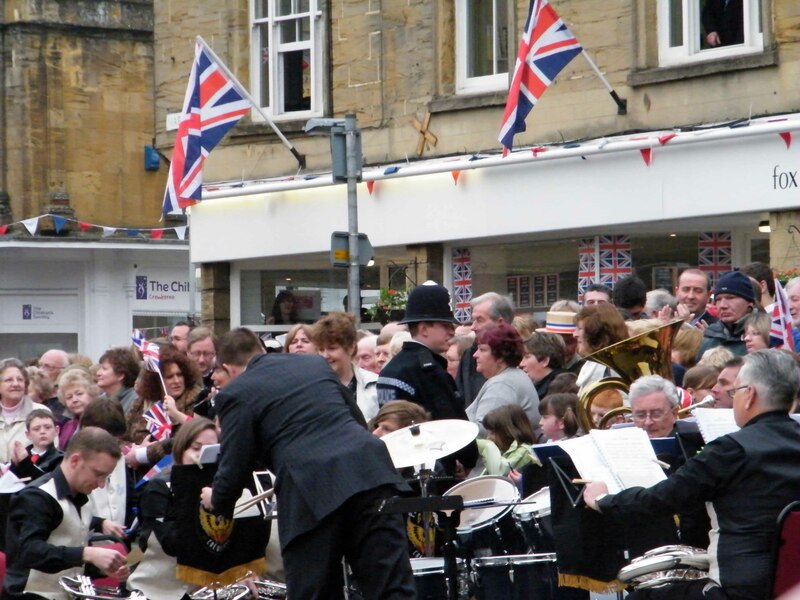 This entry was posted in Special events and tagged Crewkerne, Diamond Jubilee, Prince Phillip, Queen, queen Elizabeth, royal tour, royal visit. Bookmark the permalink.